Why should bodacious and curvy women have to settle for a less than perfect wedding dress because they aren’t size double zero? Typical bridal salons carry small sizes, which generally wedding gowns run small to begin with. Every bride should look beautiful and feel beautiful on her wedding day, regardless of her size. 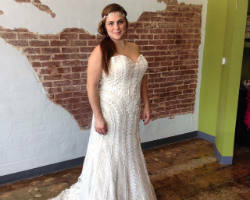 Strut is the only bridal salon in Phoenix, AZ that specializes in plus sized (sizes 16-32) bridal gowns, bridesmaid dresses, and evening gowns, all handpicked by Strut’s co-owner, Ann. Strut even allows you to try on the dresses. Not only does Strut carry a wide variety of stylish, designer gowns, all ranging from $499 to $2,499, but also the gorgeous accessories every bride needs on her wedding day. Check out Strut’s collection for yourself by either visiting the website or calling to make an appointment. Being one of the top bridal boutiques in the Phoenix Metropolitan area, Brilliant Bridal sells designer wedding dresses at a discounted price, generally 30%-80% off the retail price, making these elegant gowns affordable for any bride. Not to mention, Brilliant Bridal sells you the dress straight from the rack. This means there is neither a six month waiting period nor extra fees for custom ordering your dress. Perhaps the most unique asset to Brilliant Bridal is their eco-friendly dress option. Instead of ordering and processing a custom dress, you can take home your perfect dress immediately. Not only are you leaving the Brilliant Bridal boutique with a gorgeous dress, but you are also helping to protect the environment by eliminating the additional usage of raw materials during a second manufacturing process. Appointments are not necessary, so feel free to walk in. Bridal boutique of Arizona has just opened their doors August 2016. The owner has had 10 years running a large and successful bridal shop in Canada, winning "best in bridal" for many years over. She has moved to the "land of the sun" replicating her NY loft style shop wishing to give the brides from Arizona an exciting and fabulous five star bridal experience, thus resulting with a beautiful, stylish bride, overflowing with confidence, to take that momentous walk of her life. Together, staff have almost 100 years in bridal experience, enabling the ideal wedding gown search. Come visit us!